Today we rented a car and drove up to Newcastle to spend a few days with Brittney before heading up the coast for a two week road trip. Jamie is finally getting the hang of driving on the left and navigating his way around the corners…keeping to the left! And the wipers aren’t coming on so often every time the intention was to put on the signal 🙂 Britt and Mykee will be joining us for the one way up to Fraser Island – the largest sand island in the world! 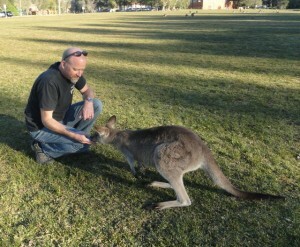 Our first stop was Morisset (30 min south of Newcastle) to see the wild kangaroos. They hang out in a field by the Psychiatric Hospital 🙂 We are able to walk right up the them and pet them – even though I was a bit scared of them rearing up on their tails and kicking me with both feet. Jamie just told me I had seen too many cartoons! It was so amazing to stand in the middle of the crowd of kangaroos and watch a little baby crawl into momma’s pouch and then pop it’s head out to munch on the grass. There was quite an intimidating large kanga just watching us from a distance. I’m assuming it was a ‘he’ because of the size… but we have no idea how to tell a ‘he’ from a ‘she’. Regardless, it was large and almost majestic as he took in our presence. From Morisset, we made our way to Newcastle and hung out with Britt and other YWAM staff for the evening. It will be great to be here for a few days! Previous PostPrevious Bicycle built for two!